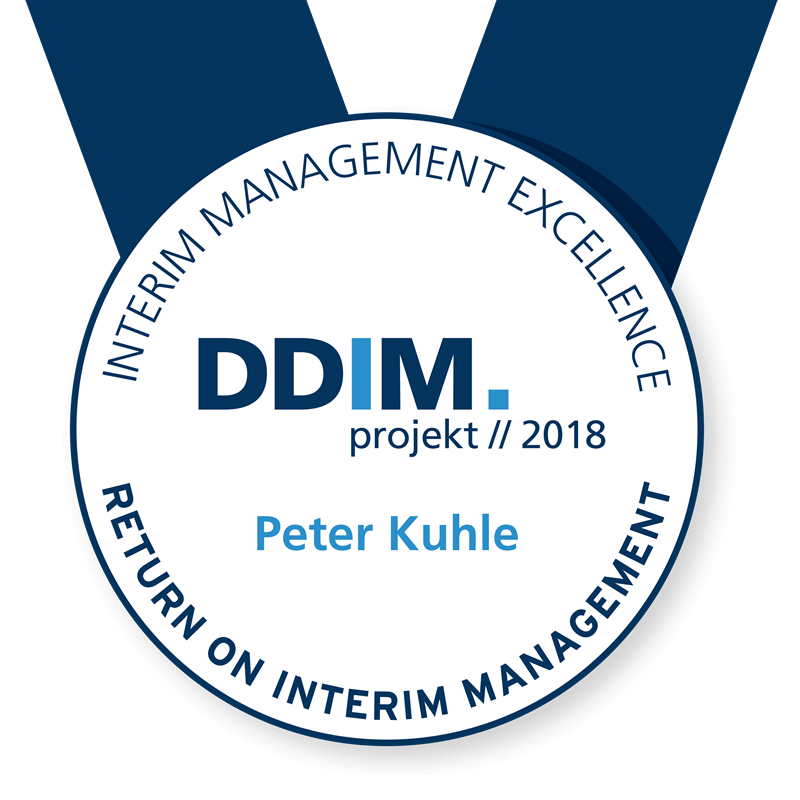 Interim Manager Peter Kuhle was awarded the “DDIM.projekt // 2018 – Interim Management Excellence” in the category of “Return on Interim Management” for his work in repositioning the Field Service Operations division at Unitymedia. The project, which Mr Kuhle was hired by the Iskander Business Partner management consultancy to take over for the cable network operator based in Cologne, was particularly noteworthy due to its high customer benefit as well as the sustainable success with regard to improving efficiency and effectiveness. The project received an award in the category Return on Interim Management (RoIM). RoIM describes the ratio of interim management costs to quantifiable benefits. The project entailed implementing a new operating model in a challenging operating situation, in which special focus was placed on the topic of leadership during change. Particularly noteworthy were the high customer benefit and the sustained success of the project for the company. The high level of customer satisfaction has also led to an extension of the project with additional requirements. Customer satisfaction, growth and digitization are the impetus for change processes in service. In order to meet these requirements even better in the future, extensive change processes were initiated in Unitymedia’s technical service. This included repositioning the service partner landscape, introducing a new control platform (digitization) and aligning the organisation based on new processes and possibilities in digitization. Implementing a new control model made a new holistic management of all those involved in the process possible with the aim of achieving the best possible results for customers. Dr. Marei Strack, Chair of DDIM, congratulates the winner and notes, “I would like to congratulate Mr Kuhle for his work on this project. One of the biggest awards is certainly the one given by the client himself, namely when it comes to extending the project on the one hand whilst also expanding the scope of tasks on the other”. For the first time this year, the Dachgesellschaft Deutsches Interim Management e. V. (DDIM) association is awarding this prize to four projects which demonstrate a particularly high level of customer benefit and which clearly demonstrate the strengths and associated opportunities for companies. These projects are thus representative of the positive development of interim management. The award ceremony was held during the DDIM Congress on 10 November 2018 in Düsseldorf. In addition to Peter Kuhle, three other interim managers were honoured for their projects. The jury consisted of Dr. Marei Strack, Chair of DDIM, Harald Meyer, Member of the Board of DDIM, Sven Astheimer, business journalist for the FAZ newspaper and Stefan Burk, Member of the Board of IWBF. Peter Kuhle (1974) is a freelance interim manager and consultant from Bad Honnef. With a specialisation in “Making Field Service & Sales Better Together”, he supports companies in phases of growth and change which are critical to success. 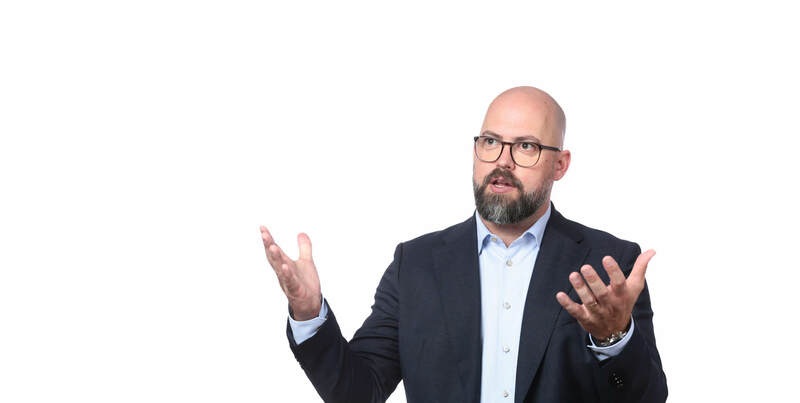 He can look back on more than 15 years of experience in sales & service as well as over 10 years in management functions at well-established companies in corporations and medium-sized businesses. He is a member of the DDIM – Dachgesellschaft Deutsches Interim Management e. V. association, the leading business and professional association for interim management in Germany. Unitymedia, based in Cologne, Germany, is one of the leading cable network operators in Germany and a subsidiary of Liberty Global. The company serves 13.0 million households in North Rhine-Westphalia, Hesse and Baden-Württemberg with its broadband cable services. In addition to offering cable TV services, Unitymedia is a leading provider of integrated triple play services combining digital cable TV, broadband Internet and telephony. As of 30 September 2018, Unitymedia had 7.2 million customers with 6.3 million TV subscriptions, 3.6 million Internet subscriptions and 3.3 million telephony subscriptions (RGUs). For further information about Unitymedia, please visit www.unitymedia.de. The Dachgesellschaft Deutsches Interim Management e. V. (DDIM) association is the leading business and professional association for interim management in Germany. It represents the interests of its members and acts as the voice of the industry. DDIM members are experienced interim managers, and DDIM partners are professional service providers in the interim management sector. Founded in 2005, Iskander Business Partner stands for measurable added value and a result-oriented partnership with customers. They advise companies in the fields of telecommunications, information, media and entertainment, retail, automotive and financial services. Iskander Business Partner develops implementation-oriented solutions to optimise or realign product, marketing, sales and CRM strategies. With a keen sense of business acumen and dedicated consultants as well as specialised experts, the management consultancy accompanies and supports its clients using tailor-made solutions from the strategy to successful implementation. Trust, transparency and customer orientation are the cornerstones of Iskander Business Partner’s corporate philosophy and are reflected in the work of each individual consultant. 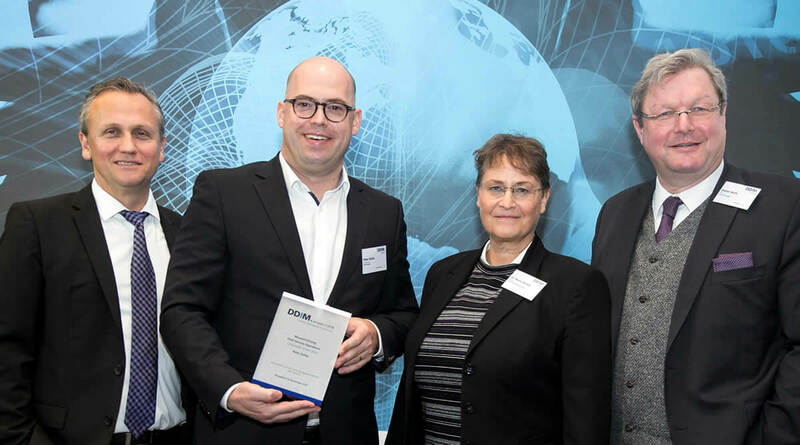 At the awards ceremony: Interim Manager Peter Kuhle is awarded the “DDIM.projekt // 2018 – Interim Management Excellence” prize in the category of “Return on Interim Management” by the CEO of the Dachgesellschaft Deutsches Interim Management e. V. (DDIM) association, Dr. Marei Strack and jury members Sven Astheimer (business journalist for the FAZ newspaper) and Stefan Burk (Member of the Board of IWBF).